While the V-VS thing is interesting, it doesn't really help much because the audience and fans (including me) will still take it as a versus. I am pretty sure 90% of the expected audience will be unaware of about the significance of "V" over "VS" because of lack of knowledge of legal terminology. I am not saying it couldn't be a great/good movie. But I just don't like the build up to it so far. MOS was messy because it did not seem to have a clear direction. And the build up to Dawn of Justice (DOJ) continues to be messy. True, but then 90% of the audience also isn't going to care whose name comes first. Actually even I don't see the big deal, what does it matter who is first, it doesn't have to mean one is more important. I think this is just nitpicky criticism to be honest. MOS:Dawn of Justice is a good title, but not as attention grabbign as havign Batman in there. Also the idea that they were forced to bring Batman in is pure speculation. We can't know what their plan was. There are some hints in MOS itself of Wayne Industries just like they are of Lexcorp, so it's actually very logical step to bring both Lex and Batman in the second movie. People are only assuming its forced because according to them MOS wasn't a massive success but frankl, if WB wanted to do a Justice League movie fairly soon, they would have definitely planned on bringing at least one of Batman or Wonder Woman in this movie. Storwise as well, it makes perfect sense cause the kind of event that happened in MOS, would not go unnoticed by other heroes. That's the difference from marvel phase one movies, they didn't have any whole world threatening events. They were more isolated incidents, and in Captain America's, completely different era too. Also something I've been meaning to say for ages but keep forgetting is X-men, those movies have shown that you can easily do multiple powered heroes without prior individual movies. It is possible to develop more than one superhero character through a movie. X-Men First Class especially, such a great example of this. They developed Magneto, Xavier and Mystique who are all major characters so brilliantly. And even the other supporting characters, you definitely cared for. People are just hung up on this cause Batman/WW are bigger names, but I think that actually works to advantage rather than disadvantage cause people already know who they are so you don't even need as much character development as you normally might. I think you missed the point I made about Zack Snyder himself saying that he wanted to make MOS2 initially and expand on Superman's story IF you put two and two together, Batman's addition clearly seems like an after-thought. And I have nothing against big characters being introduced in the same movie. Its just that it feels like Green Lantern again. That one did not do well, and WB went into panic mode and changed direction. Now MOS hasn't performed as well as they expected it to and once again WB is relying on Batman like they have been doing for all these years. It just shows desperation. Yeah I do remember comments that MOS was going to be separate, but honestly I never believed that-I just figured they weren't ready to reveal anything yet, because if that was the case, then Justice League would have to create another different Superman as well as a new Batman. And that would just be incredibly dumb. Plus despite the comments, there were always strong rumours that MOS was goign to be start of new cinematic universe. It was a really badly kept secret lol. Also I think they could have changed their mind, but that doesn't mean it's forced in, it could jsut be they hadn't thought about it much before. I mean Chris NOlan once said he would never include Robin, but he did, I don't think he was forced. And while Zack did at one point say separate universe, he did say this after MOS. I gotta be honest, it definitely was a thing that… after Man of Steel finished and we started talking about what would be in the next movie, I started subtly mentioning that it would be cool if he faced Batman. In the first meeting, it was like, “Maybe Batman?” Maybe at the end of the second movie, some Kryptonite gets delivered to Bruce Wayne’s house or something. Like in a cryptic way, that’s the first time we see him. But then, once you say it out loud, right? You’re in a story meeting talking about, like, who should [Superman] fight if he fought this giant alien threat Zod who was basically his equal physically, from his planet, fighting on our turf… You know, who to fight next? The problem is, once you say it out loud, then it’s kind of hard to go back, right? Once you say, “What about Batman?” then you realize, “Okay, that’s a cool idea. What else?” I mean, what do you say after that? …But I’m not gonna say at all that when I took the job to do Man of Steel that I did it in a subversive way to get to Batman. I really believe that only after contemplating who could face [Superman] did Batman come into the picture. I think DC just didn't want to reveal anything before seeing how MOS fared, cause imagine if it had bombed, then all their plans would have been dust. At least it wasnt' a failure, it was actually a success, just not as big as perhaps was expected. So hard to know what their plan was. You could be right that Snyder is forced to bring Batman in, but I prefer to be positive. You know you might want to give Watchmen a second watch, I think it's actually a good movie though not great. The slow pace is a tad annoying though however I think it picks up later, I don't know how much you watched. ALso it's worht it just for Roscharch's character I feel. Re MOS being too dark and serious, I've seen these comments before about how it doesnt' suit Superman. And I just don't agree. I think these commetns are based on people's slightly lopsided idea of Superman from pop culture and media that always has him as mr goody two shoes and always happy and kinda goofy. Superman in comics has been done seriously more than a few times and I was glad to get a movie that tried to do a serious take on the character instead of always having him as this goofball. Even some of the animated movies and shows have shown him in a more serious light and done it very successfully. MOS is actually much more faithful than people realise. I don't think the problem with the movie was that it was too serious. It was the script that was not that great in terms of developing the characters and there was far too much action. The general audience though only seems to know him from Christopher Reeve's movies and Smallville, they don't know otherwise. And I was in a similar boat actually. Two years ago, I didn't know much about Superman, didn't even like him much cause seemed too cheesy and a bit lame. Plus I hated the costume. Then I saw the trailer for MOS which I thought was just amazing. The movie may not have been great, but trailer sure as hell was. I just wish the movie had been more like the trailer, it suggested more character focus compared to action. ANd I started watching a lot of Superman stuff - saw all the animated stuff in past decade or so as well as all of Smallville. And I loved the character, became a fan. Second only to Batman now. So I guess that's one reason why i"m really thankful to MOS, in a way if I had never seen that trailer, I wouldn't have got into Superman. I"m not the only one either, I know a few people who did the same thing. So I think in some ways MOS has been successful because it has brought Superman to a new audience, which I think was always the main intention. About Watchmen - I tried it twice because a good chunk of the audience swears that this movie is brilliant. First time I fell asleep. Second time, I did get past the halfway point, but just couldn't hack the insipid pace and over-stylized execution. It felt very forced and not natural at all (unlike say Sin City or 300). Sucker Punch had the same problem. MOS had similar problems, but was slightly better. I appreciate your honesty And I think we are about to start going in circles lol. But regardless..
Just based on the interviews my straightforward theory is that MOS series was going to be Zack Snyder's Dark Knight trilogy. I mean, just the confidence with which he outright rejects the thought of his Superman sharing JL universe indicates that. WB were clearly unsure on how to go about establishing their JL universe, thanks to the debacle of Green Lantern and Bale refusing to be Batman if it wasn't with Nolan. ^haha yeah we are starting to go in circles lol. By the way, didn't evne talk about the Ben Affleck pictures, I think he definitely looks the part, it's so much like Bruce Wayne from cartoons and comics. Acting wise won't know until movie obviously. ^oh yeah I've seen that, was meaning to post but wasn't sure if it would be allowed. I haven't found anything better though. it's very brief but looks epic. What did you think of it? I think the Chris Terrio part excites me the most, my biggest problem with MOS was the script by David Goyer, not really Zack Snyder's direction. I think David Goyer by himself doesn't work. He worked with Nolan because Nolan was able to refine his scripts and improve them. So I'm glad this time also they brought in someone else to look over and basically rewrite it. And Chris Terrio only recently did the amazing script for Argo so I'm more hopeful. ^I totally agree, Henry Cavill is just perfect as Superman even without the curl or the red underwear. Its like I read somewhere, he just looks like he stepped out of the pages of the comics. 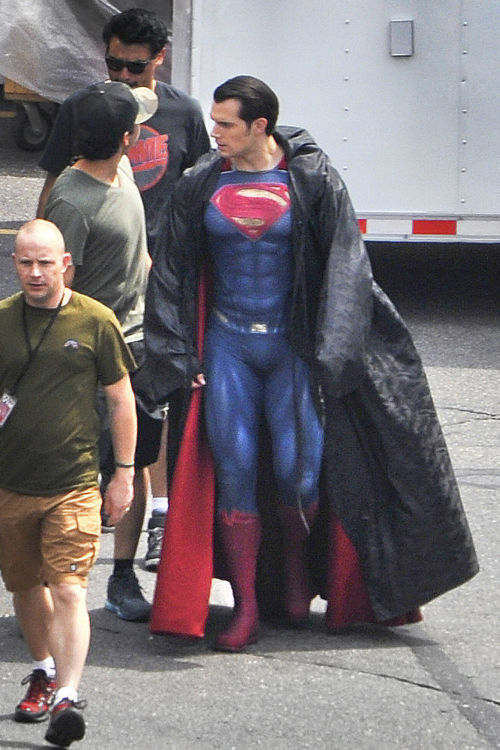 Henry as the reporter Clark kent, this is actually what I've been most looking forward to because we only had a very small glimpse of it in MOS at the very end. I saw the official teaser posted by Zach SNyder but that didn't really show anything. Didn't know there was a leaked one out there. Though I might just wait until a good quality one comes. Doesn't reveal much but looks really good. Loved the dialogues. Didn't like the explosions towards the end though (seen a lot of that in recent superhero films). I love the trailer, I just hope this time a good trailer actually means a good movie. Loved the dialogues as well. And Batman's voice. Still find Ben Affleck as batman too weird. I'll give the movie a shot, but it's just bizarre. Really liked the trailer. But still don't have high hopes for this movie, probably because the first one was so bad. ^I always had the feeling it would have the original colours in there and that it was just the colour filter of the photo that made it seem otherwise.